Have ample seating for your next event. Shop our full assortment of banquet chairs for sale at BizChair to find the best seating options for your needs. Provide comfortable seating for large groups of people with durable stacking banquet chairs. Designed with plenty of seat padding wrapped in stylish upholstery, our banquet chairs keep your guests comfortable throughout your event. Shop our range of high-quality stackable banquet chairs to find the perfect seating solutions for conference rooms, hotels, churches, schools, reception halls and more. Keep conference attendees more comfortable and eager to absorb information while seated in softly cushioned banquet chairs. They feature strong steel frames for stability, long-lasting durability and higher weight capacities, while the padded, upholstered seats and backs deliver soft support. Simple lines lend a universal design appeal to these stacking banquet chairs, giving your event a sleek, professional look. Seat guests for the ceremony or the reception on the sleek design of banquet chairs. The versatile silhouette provides a uniform look that blends effortlessly with most décor, giving you maximum flexibility. Durable, powder-coated steel frames and softly padded fabric seats and backs provide stable, comfortable seating, even during longer events. Choose from a wide range of upholstery colors and back styles to match the occasion and the venue. Bring durability, style, comfort and ease of maintenance to your hotel’s restaurant seating and conference area’s design with our selection of comfortable, sophisticated stackable banquet chairs. Choose from a range of upholstery colors and fabrics, as well as back styles, for a look that best complements your décor. Non-marring floor glides and sturdy steel frames help ensure you get plenty of use out of these durable seating solutions. 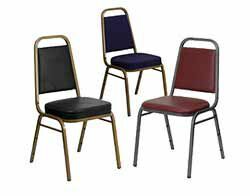 Our stacking banquet chairs can be used for a wide range of residential and commercial use. Add them to classrooms, churches, theaters, training rooms, convention centers, banquet halls and even dining rooms to provide a comfortable, supportive seat for all your guests. Choose designs that blend seamlessly in both formal and casual settings to re-use these seats as often as needed. When they’re not in use, our banquet chairs can be stacked to save space. Plus, with integrated back handles on each chair, it’s easy to pick up and move your chairs around. If you need to set up and take down banquet chairs regularly, add a stack chair dolly to your order. These tools can help you move several chairs at once, making transportation to and from the event simple. Many of our banquet stacking chairs are in stock and ready to ship, so they’ll be on their way to you within one business day of your order. Shop now to find the best options for your venue, including banquet chairs with trapezoid, crown, dome or teardrop backs in a wide range of colors and upholstery options.